TVG.com was established in 1993 and is now one of the largest legal betting sites in the United States. The company is headquartered on US soil and is owned as a subsidiary of Betfair, which is itself one of the largest internet gaming brands in the world. If you have any interest in online horse betting, TVG should be on your shortlist of sites to visit. TVG.com has been taking horse racing wagers since 1993 and has earned a reputation for reliability over the years. 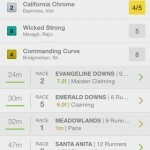 Live racing video and in-depth handicapping tools are strong selling points for this betting site. You may also know of the TVG name through your cable provider. In 1999, they started the TVG Network (Television Games Network) as a channel that broadcasts live horse races, commentary, handicapping tips and industry news. You can find the channel on DirecTV, the Dish Network and certain cable companies. As nice as the television channel may be, the purpose of this TVG review is to discuss their online wagering service. It’s one of the big names in racing betting so it only makes sense to spend a little time discussing what it’s like to bet at TVG.com. TVG is partnered with more than 150 racetracks and allows you to place the same wagers that are available at each track. All payouts are set at true track odds which means you get paid the same amount of money as anyone who might have placed the same bet in person. 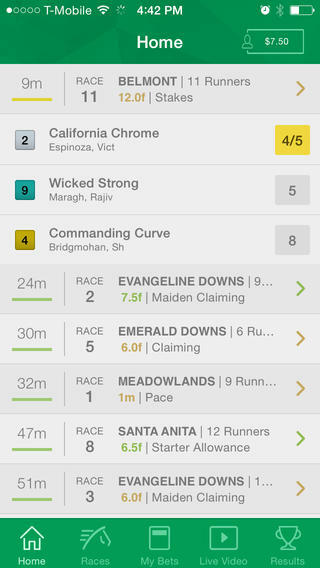 It works like that because all bets placed online are comingled with the bets accepted in-person at each track. Bets are accepted online at TVG.com, by phone and from your mobile device at the mobile website or through the App which you can get from the iTunes store. No matter which method you use, you have access to all 150+ tracks. Speaking of which, the tracks list covers all the major tracks in North America as well as tracks in Dubai, Australia, Great Britain, China, Ireland, Japan, New Zealand and South Africa. Placing your bets is a simple process of selecting from the daily list of tracks, choosing a race and then using the step-by-step interface to pick your wager. You’ll get a chance to confirm your bet and see the predicted payout odds before you submit it for good. 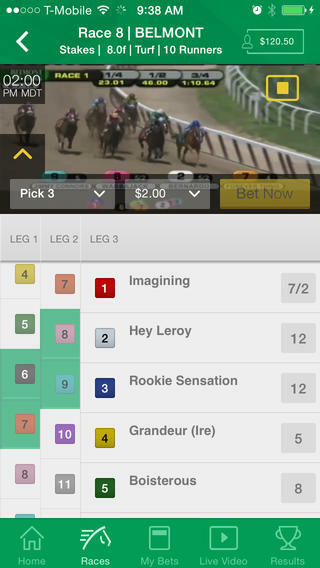 Like any decent horse racing site, TVG.com has mobile users in mind. You can head over to www.tvg.com from your smartphone or tablet and the website will serve you the mobile version automatically. You can log in to your account and place bets from there. Everything on the mobile site is designed with the limitations of phones and tablets in mind. There’s also an iPad app that you can get at the iTunes store. The app looks and functions pretty similarly to the website although it’s a little easier to use. This is the way to go if you have any Apple device. 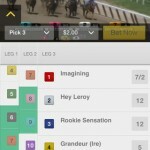 Everyone else can just visit tvg.com for the regular mobile interface. You don’t need the TV channel to watch live races and commentary. 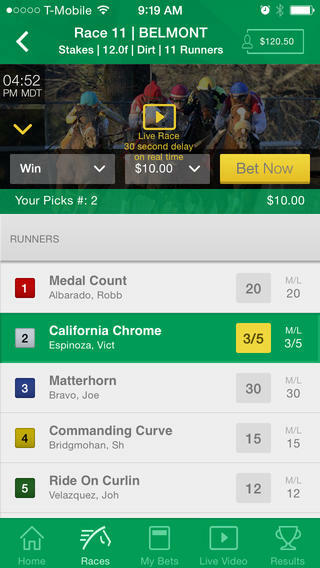 All you need is an account at TVG.com and you can watch the races in real time on your computer or mobile device. You get 10 hours of free streaming time every month. If that’s not enough, you can pay $3 to add 10 more hours to your monthly quota. You also get an hour added to your account for every $25 you spend on wagering. Other sites may offer unlimited video, but this system really isn’t that bad. The odds are you won’t be watching that much live racing every month without placing at least a few bets to get time added to your account. If not, it’s just $3 to get an extra 10 hours. TVG offers two welcome bonuses to all new customers. First, you’ll get $20 free just for signing up with no deposit necessary. All you need to do is sign up for an account and use the promo code WELCOME and they’ll start you off with $20 to bet on horses. After that, TVG will give you a second bonus when you make your first real money deposit. The TVG deposit bonus offers 100% extra for up to $75 in bonus cash. That means a $75 deposit would get you $75 in bonus money for a starting balance of $150. 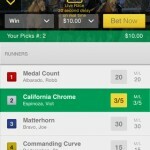 TVG has a whole suite of handicapping tools designed to improve your game. Remember – parimutuel betting sites don’t care if you win or lose because they collect their commission no matter what happens. You don’t compete against the book; you compete against the general public. That’s why TVG is willing to give you free handicapping tips at the blog, a members-only newsletter, free pro picks, free TimeformUS Past Performances for every track and much more. You get access to everything as soon as you sign up for your free account. You can see some of it without an account if you visit tvg.com but you’ll need to sign up to get complete access. It takes maybe 5 minutes to get an account so I’d recommend it even if you don’t plan on betting at TVG. The more tools you have at your disposal, the better. TVG is licensed in the United States and that means easy deposits for everyone. You can fund your account with a credit card, debit card, Green Dot MoneyPak, electronic funds transfer, checks, money orders, online bill pay if your bank has it and wire transfers for deposits of $1,000 or more. Note: The minimum fees only apply after your first deposit. Your first deposit ever must be $25 or more. Licensed horse betting sites in the United States are required to get the approval of each state where they offer services. Each site therefore has a different list of restricted and accepted states. Below is a list of the states from which TVG accepts customers. If your state isn’t on this list, check with one of the other sites to see if you can play there instead. Overall, TVG has everything I look for in a horse betting site. 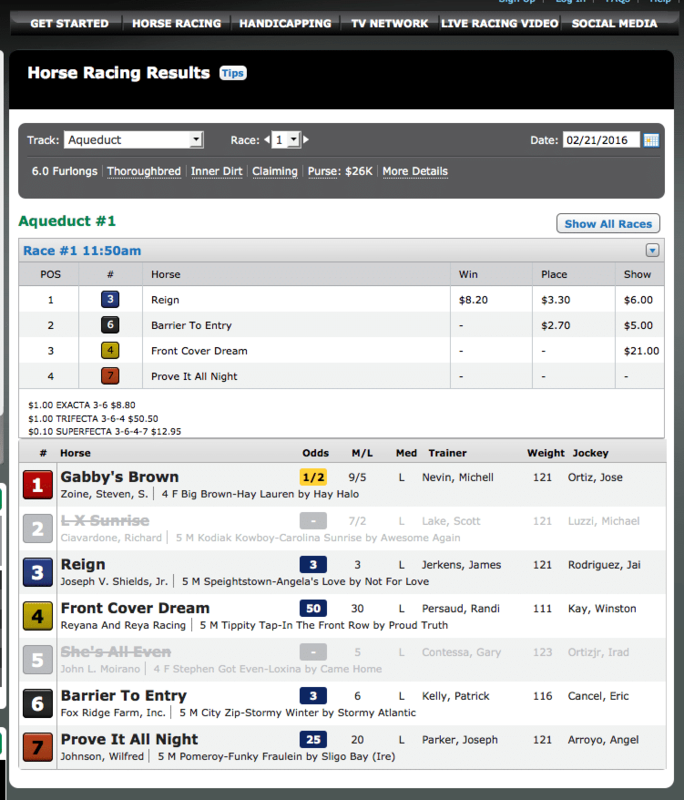 The betting interface is easy to use and the site has a solid reputation for paying winners. My final opinion is that you won’t go wrong choosing TVG to bet on horses online.